Who seen this partnership coming? Who cares, this is gonna be sweet =D.
" The FINAL FANTASY® XV universe continues to expand as SQUARE ENIX® today revealed an exciting collaboration with Ubisoft Entertainment’s hit Assassin’s Creed® franchise, available as a free download from the Xbox Games Store and PlayStation®Store. Noodle Helmet Outfit - this mysterious, famed Nissin Cup Noodle outfit musters up Noctis and his comrades’ energy and remarkably increases their HP recovery rate. Timed Quest Updates - Additional limited-time “Timed Quests” have been added to the quest tracker. Exhibition of Third Snapshot Contest Winning Photos - The winning photos from the third community Snapshot Contest are now on display at Galdin Quay. Bestiary - A gallery where players can see the enemies they have defeated in battle and take an in-depth visual look at the enemy is now available via the menu screen. Chapter Select - Players can now select and play various chapters from the main menu. This feature can only be accessed after completing the game. 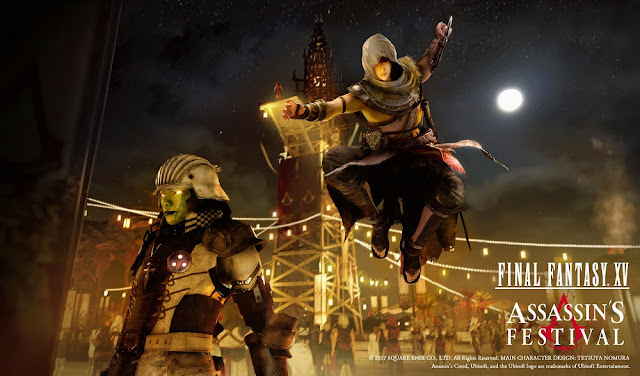 Assassin's Creed, Assassins Festival in Final Fantasy XV... Need I say more.... I gotta check this out... More thoughts coming soon..